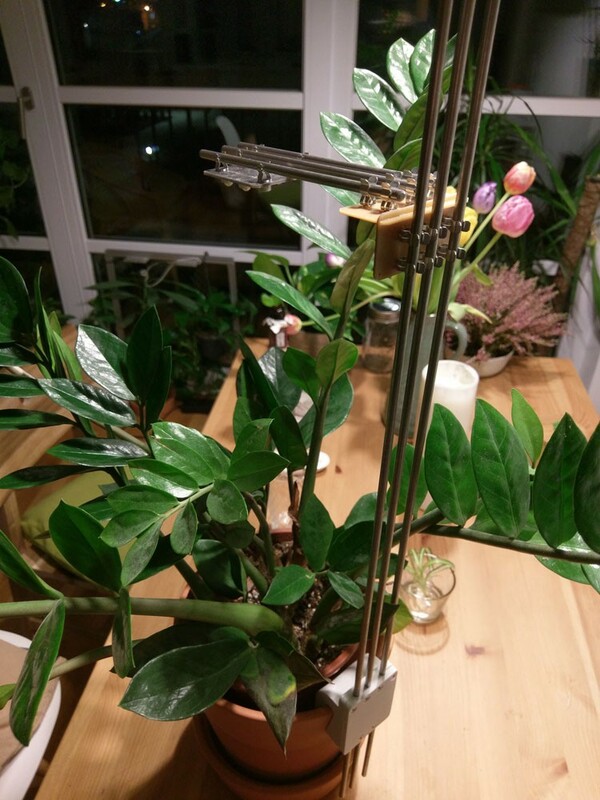 So, as the plant grows, the light module moves itself further up the rails? Coming up! I already have a design in mind and ordered some parts, definitely think that can be incorporated. Love the username by the way. But why? Just because the sun is at one, pretty high altitude does not mean the LEDs have to. What about multi layer growing, the tall plants get light from the tall LEDs all the while the smaller varieties, or perhaps the tiny next generation of tall ones get their light fro the mid/lower LEDs. The reason we have seedling trays is so that we can grow the next generation before this generation has died, with 3D light sources you can catch light at all layers, increasing density and allowing the seedlings to grow under the parents without lacking sunlight. If you dont move the light up the plant will bump into the light and burn its leafs. For plants like tomatoes and zucchini it’s advisable to limit the amount of water that hits the leaves. Especially in a greenhouse / indoor environment as this can spread or encourage disease like mosaic virus, powdery mildew, and leaf roll. A dripper at the base of the plant, or since they are already in a plastic tub, bottom watering greatly reduces the chances of these issues. In the video on the project page it was mentioned that the lights can be dimmed to emulate twilight conditions, which while aesthetically pleasing is, as far as I’m aware, entirely unnecessary for optimum plant growth. One final nitpick is the insinuation that indoor growing is more efficient than outdoor growing. This is only cosmetically true, as the professor pointed out temperature control afforded by indoor growing enables the plants to have a much longer or indefinite growing season but once you factor in energy spent to get a given weight of produce, outdoor growing is the clear winner. Polytunnels or framed in greenhouses can extend the growing season considerably and with proper insulation and passive heating (or even a few active) measures they can provide near year round growing conditions without a utility bill inflating operating costs. Usually you will water at the very bottom where, at least for larger plants, it wont hit any leaves. totally! Its nice though if its in a living room environment that the lights slowly go dimmer until they actually turn off instead of switching off instantly. Making it “nice” for the living room is an important factor for me where I think similar projects haven’t given any attention to. As far as efficiency goes, I absolutely agree, nothing beats free sunlight. Maybe my tomato comparison gave you the impression that I was comparing efficiency, it was just about the plant size and health for me for compared to standard balcony summer conditions so I have something to compare against. The system is meant for the cold seasons where you can’t grow at all on your balcony or garden (or when you have neither of those). I would never see it in competition to actually growing in your garden. >>Usually you will water at the very bottom where, at least for larger plants, it wont hit any leaves. I just saw in one of the videos where you looked to be using a spray / mister head which even if aimed at the base have significant over spray. Ideally your fan setup will prevent these concerns and given that you’re in a normal room, not a greenhouse, it shouldn’t be a huge issue. I probably just misread / otherwise missed the point of your paragraph. I guess I’m just used to seeing people make pie in the sky claims about how indoor growing is going to be the next agricultural revolution right up there with the plow or Haber-Bosch. Guilty! I am undoubtedly one of those people. My point number one is that more energy is spent on moving heavy machinery and processing the soil with them, than amount of free sun light energy is used by plants (or at least, so I’ve been told). Point number two is that water, additional nutrients and pest control chemicals are wasted in an open-cycle application, while in closed controlled environment they can be reused, and runoff into natural environment and water table prevented. Point number three is that open range agriculture is too risky business, commanding large insurance rates and favouring overproduction and stocking of produce, which is all wasteful for society (although it is an opportunity for speculative profit, however see “Broken window fallacy”). Fully controlled environment agriculture would allow just-in-time production and quick adjustments of supply to any variations in demand. Point number four is that artificial agriculture allows multi-story reuse of available land, or allows even the existence of wast subterranean farming facilities. It is important point for small, heavily dense populated communities, as well as those with lack of arable land or those with any kind of unfavourable climate. I admit the following is a lot of SciFi babbling, but subterranean plant produce factories would be arguably impervious to nuclear war induced or asteroid strike induced global “winters”, provided their individual energy suppliers survive and continue to operate. That is almost as good or even better insurance than colonising other planets, speaking of which, that colonization can’t even happen without perfecting indoors farming first. So yes, I do consider that as game-changing potentially on pair or more disruptive than plow or Haber-Bosch process. That would literally blow the top off and remove any fear that the humanity could starve, for millennia ahead, and all that without further deterioration of biodiversity. We are certainly not at the point where those promises are near to be revolutionary fulfilled, but it is the direction we should be taking the evolution of agriculture. Even if that were true So what? How else do we harvest millions of acres of grain to feed whole countries? You’re talking about a couple gallons of diesel per acre for most modern combines. You still have the problem of fertilizer. Hydroponics solutions are mixed from the same petrochemical fertilizer as the ones sprayed on fields. Aquaponics requires some source of fish food, which is generally ground up by-catch and bone meal with some minerals and secret spices thrown in. Plants like tomatoes and peppers require 8 and 16 hours of direct sunlight, respectively, to set fruit. No one builds a civilization based on these two plants so we’ll take a look at field corn. Field corn requires 8-10 hours of direct sunlight with 10 hours producing better yields, for at least 120 frost free days. I’ve seen a journal article (and county Ag pages) that state corn can use up to 2500 foot-candles (about 40 watts) per leaf and typically 20 leaves per plant.To that end the leaf surface area of an acre of corn is 3-4 acres which absorbs 95% of incident light. Given that an acre is just under 4050 square meters and solar insolation is ~1000 W/sqm we’re talking about 4MW of light per acre. Indoor growing just can’t compete with megawatts of free lighting. The largest nuclear power plant in the US is currently 3937MW which translates to under 1000 acres of corn at 100% energy -> light conversion. That’s on top of all the energy needed to harvest crops. That’s more a reason to change how we farm outside. Many places already are, with strict regulations on how often and how deep you can till, how much fertilizer you can apply and when you can apply it. Ask anyone with a greenhouse how fast pests and disease can tear through one. You may have greatly reduced the impact of weather, but power outages still happen and climate control is expensive. This only matters in exo-colonies or places where the growing season is too short to grow staple crops. High energy costs will always make shipping from warmer climates more economic. >>…that [space] colonization can’t even happen without perfecting indoors farming first. Only if you completely ignore exo-earths or usable soil on other planets. Even Mars probably has a moderately fertile soil, once you deal with cosmic radiation and build a pressurized green house. An exception is Iceland, which uses geothermal power to grow bananas! This first point is a key point on which the whole idea hangs. If the additional cost of artificial light energy is lower then the difference between energy spent on agro field machinery and energy spent by indoors manipulators and peristaltics, then it flies, otherwise, it falls. “I’ve seen a journal article (and county Ag pages) that state corn can use up to 2500 foot-candles (about 40 watts) per leaf and typically 20 leaves per plant.To that end the leaf surface area of an acre of corn is 3-4 acres which absorbs 95% of incident light. If I understood that well, your data says that single corn plants can absorb up to 800W at a time. Absorption of 95% of incident light is dubious, corn is not pitch black, so we’ll have to limit that to only two spectral lines plants actually use. Now the second data point, 4MW of light per acre. From the first data point, that would be more than enough (remember, “up to”) for 4M/800 = 5000 stalks of corn. SQRT(5000) is a bit less then 71, and square with area of one acre should have SQRT(4050) = 63m. If corn was sown in a quadratic grid, in an ideal field there would be a stalk of corn on every three feet, which is too much space apart. Last time I’ve seen corn field, there were much more stalks, so I guess that perhaps individual corn plant doesn’t need as much light as your first data point suggests, and even less, because the figure of 1000 W/sqm is probably over whole spectrum, including the wavelengths not needed by the plant. I believe you are overestimating the amount of light energy actually used, but perhaps that means that with stronger artificial light source, the plants could bring greater yield than they do with available sunlight. While that may be true, I’ve got some fertilizer which specifically says to spray it on the foliage. You mean the www. virus that Mosaic spread throughout the Internet? No, Fartsparkle is in Europe. As well as the “handshake deal” with Mr. Henry Ford!